To have a sustainable impact on children’s lives, War Child works not only with children, but also strengthens the capacity of important actors in the lives of children. We enable parents and caregivers, teachers, social workers and local authorities to fulfil their responsibility towards children, positively interact with them and give them the support they need to develop to their full potential. 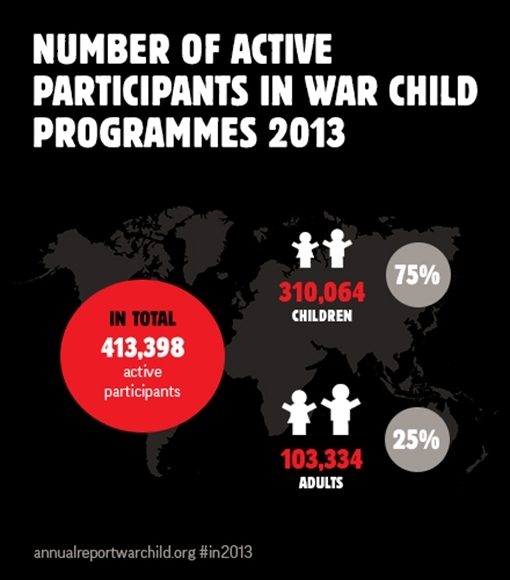 In 2013, more than 103,000 adults participated in awareness raising activities, workshops on child rights and child development, or in technical skills trainings such as child-centred teaching. In 2013, a total of 413,398 people (3 percent more than planned), of which 75 percent were children, actively participated in our activities. 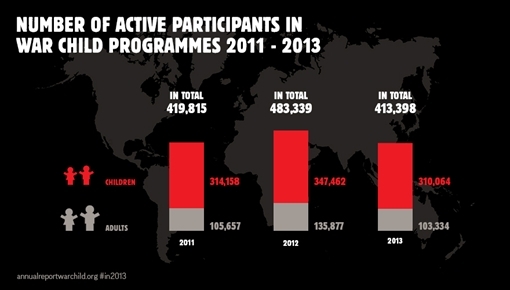 As planned, the total number of active participants was lower than in 2012 (15 percent decrease). This is due to a decreased focus on numbers and an increased focus on the quality and effectiveness of our projects: more activities with the same children result in better psychosocial development, protection, education and participation outcomes for the children involved.